Recently, examination of deoxyribiose nucleic acids in water samples (environmental DNA or eDNA) has shown promise for identifying fish species present in water bodies. In water, eDNA is the result of bodily secretions such as mucus, gametes, and feces. We investigated whether eDNA can be effective for characterizing fish relative abundance, biomass, and species composition in large (>200 ha) waterbodies. 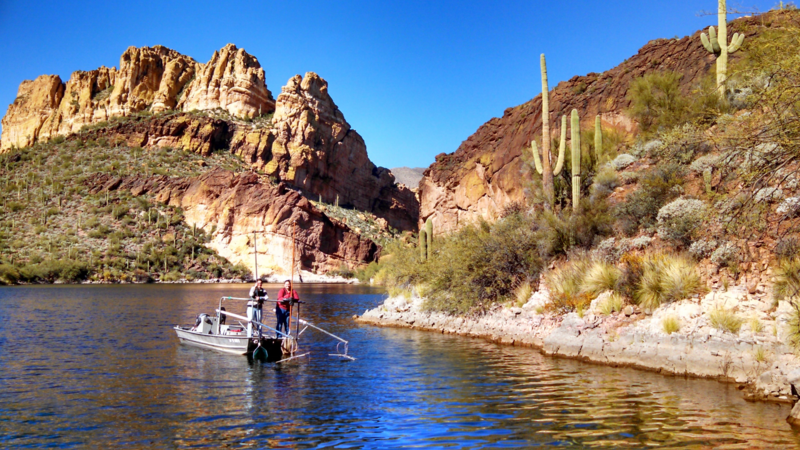 We compared fish relative abundance, biomass, and species composition measured through eDNA methods and established American Fisheries Society (AFS) standard sampling methods in Theodore Roosevelt Lake (Lake Roosevelt), an 8,698 ha reservoir in the Tonto National Forest, Arizona. We compared Largemouth Bass Micropterus salmoides and Gizzard Shad Dorosoma cepedianum catch at electrofishing and gill netting sites with their eDNA in water samples collected at those same sites. We found no relationship between relative abundance and biomass of these fish captured by established methods and their DNA copies at individual sites or by lake section. However, we observed that eDNA reflected relative proportions of Largemouth Bass and Gizzard Shad in total catch composition for the reservoir. Furthermore, we identified seasonal differences in catch of fish species utilizing all three methods. Catch by electrofishing, gillnetting, and number of eDNA copies were higher in Spring than Fall for both species. Our study suggests eDNA collections will not be useful for in-lake comparisons in a large, mixed reservoir such as Lake Roosevelt. However, they may be useful for characterizing relative abundance and biomass in an overall lake. A thesis was finished on this work in May, 2016 and an article was published in 2017 in the North American Journal of Fisheries Management. Partners include AZGFD. Perez, C. R. 2016. Relationship between American Fisheries Society standard fish sampling techniques and environmental DNA (eDNA) for characterizing fish presence, relative abundance, biomass and species composition in Arizona standing waters. Master's Thesis, University of Arizona, Tucson. Perez, C. R., S. A. Bonar, J. J. Amberg, C. Rees, W. T. Stewart, C. Gill, C. Cantrell. 2015. Correlation of eDNA (Environmental DNA) surveys with traditional fish sampling surveys in standing waters. The Joint Annual Meeting of the Arizona/New Mexico American Fisheries Society and the Wildlife Society, Las Cruces, New Mexico. February 5 – February 7, 2015. Contributed Oral Presentation. Perez, C. R., S. A. Bonar, W. T. Stewart, C. Gill, and C. Cantrell. 2015. Comparison of length frequency, condition, and growth of select sport fish species in Arizona with those in other areas of North America. The Joint Annual Meeting of the Arizona/New Mexico American Fisheries Society and the Wildlife Society, Las Cruces, New Mexico. February 5 – February 7, 2015. Poster Presentation. C. Cantrell. 2015. Use of the AFS Standard Sampling Web Tool to Compare Length Frequency, Condition, and Catch per Unit Effort of Largemouth Bass Micropterus salmoides. 145th Annual Meeting of the American Fisheries Society, Portland, Oregon, August 16-20, 2015.